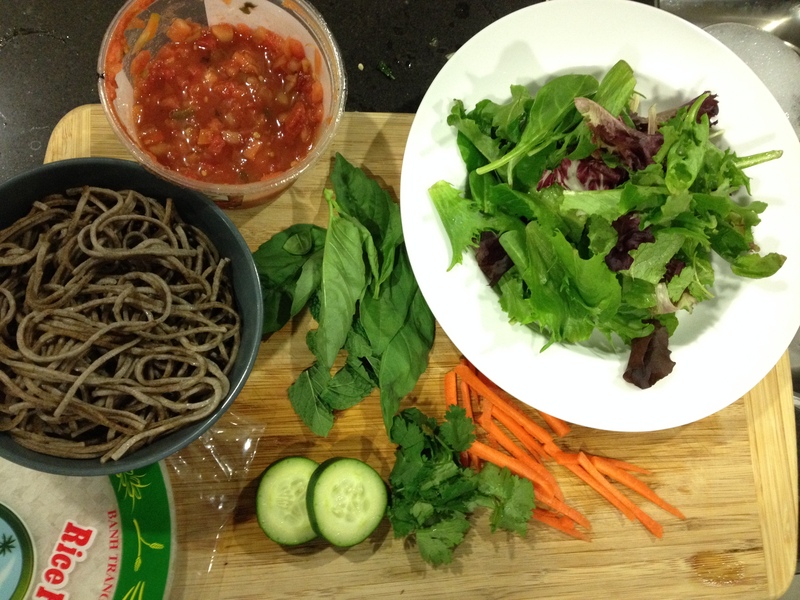 For the first half of dinner, I made some fresh salad rolls with chilled Japanese Soba noodles. I think Soba buckwheat noodles are usually served chilled. I added some Ponzu sauce to the noodles, and put them in the fridge while I went to spin. These ingredients made three salad rolls. The fresh basil, mint, and cilantro make the dish. I’ll probably make a veggie burger, then have some Weetabix and fruit for dessert. BTW, if it isn’t clear, I prefer to eat this way. I’m not force-feeding myself vegetables. I love this stuff. That’s what makes losing weight so easy. I make fresh food, and eat until I’m full. Unlike hyper-palatable junk food, you can’t binge on this stuff. ← Previous Post If There’s No Food Reward, Then Why Do I Eat The Whole Box Of Cookies?